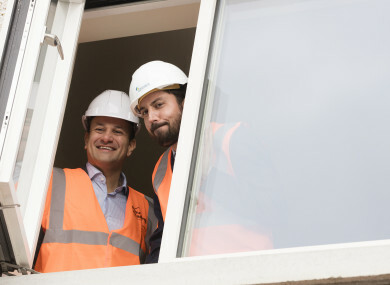 Leo Varadkar and Housing Minister Eoghan Murphy looking out the window of a new development in Dublin earlier this week. THE ISSUE OF affordable housing was raised this week in the Dáil. Sinn Féin housing spokesperson Eoin Ó Broin was critical on An Taoiseach Leo Varadkar’s use of the term “affordable” when referring to houses on sale in a development in Dublin Fingal. The houses in the Hansfield Wood development are selling for €315,000 minimum for a three-bed unit. Ó Broin said that this is outside of the range of many low-income families and is therefore not “affordable”. Ó Broin uses a definition of affordable housing (and people who are eligible for that housing) that was in use by the State when it offered affordable housing schemes in the past. Under a common scheme, if the gross joint income of a two-income household before tax was €75,000 or less they would be eligible for affordable housing – with the housing itself being sold at below market value. The schemes were all discontinued in 2011 for a variety of reasons. But there has been agitation from the opposition and signals from government that they may be re-introduced. Housing prices in urban areas like Dublin, Cork and Galway have skyrocketed in recent years as demand has far outstripped supply. Housing is one of the key challenges facing the current government which has come under increasing criticism for a failure to stem rising rents and the number of people entering homelessness. While affordable housing schemes may sound like a positive way forward, there were a number of issues with previous schemes that may need to be addressed. The Planning and Development Act (2000) laid the groundwork for a number of affordable housing and social housing schemes to be introduced. As defined in the act, a person would be eligible to apply for affordable housing if they met certain income criteria (say, earning up to €75,000 a year). As well as this the payments on a normal mortgage over the course of a year had to be over 35% of their net income after tax. Local authorities then supplied a certain number of houses through different schemes that would sell for less than market value to be bought by this cohort of people. Affordable units were also delivered under Part V legislation – whereby private developers had to provide up to 20% of a development for either affordable or social housing. In 2011, the then-Fine Gael Labour government stood down all affordable housing schemes due to a shift in policy. The government wanted to encourage more people to rent instead of purchase their home. There were a number of issues with the schemes that were also causing concerns for politicians at the time. A large number of the mortgages that were granted had fallen into arrears by the time the schemes were discontinued. The housing market collapse in 2008 contributed to this. As well as this, however, a large number of the units provided weren’t sold due to a lack of demand, particularly in areas outside of Dublin. A third issue raised was the large state subsidies needed to finance affordable house builds. When a house is sold onto a person at an affordable rate, they can later sell it on at full cost, meaning that the costs in making them affordable are mostly lost to the state. Back in July, Housing Minister Eoghan Murphy handed over the keys to the first five homeowners of a new affordable housing development in Ballymun. The development will consist of 49 houses when full complete, with prices starting at €160,000 for a three-bedroom up to €219,000 for a four-bedroom house. It is operated by the Ó Cualann Cohousing Alliance (an approved charitable housing body) and is specifically aimed at families with yearly income thresholds of €36,000 to €80,000. Speaking in July, Murphy said he wanted to see more of these kinds of developments. “These are affordable homes in our capital city and this is something I, as minister for housing, want to see more of,” he said. Speaking more recently on Budget Day last month, Murphy restated his intention to introduce more affordable housing schemes. “We will be opening more affordable schemes,” he said. He said this would be achieved by ascertaining what is affordable for a particular couple who earn 50k for example, or it could be looking at the rolling out the O’Cualann model. “We will have different schemes depending on the site,” he said, adding that his department will be outlining what income someone might be earning in order to affordable homes. As well this, the Local Infrastructure Housing Activation Fund (LIHAF) was announced last year, which will see investment of €226 million to facilitate 23,000 new homes by 2021. The plan had originally been pitched as a way to lower the cost of building and the cost of housing and had originally been seen as a way to ensure affordable housing was built. But there has been a considerable softening in this stance around how many units will actually be built at below €300,000 since then. Read: Will a €226 million fund make housing more affordable? As well as this, as Eoin Ó Broin has pointed out, the state currently has no working definition of what actually constitutes affordable housing. Michelle Norris, head of the school of Social Policy, Social Work and Social Justice at UCD advises caution when considering a return to the affordable housing models of the past. “Another such model in use that could be considered is the Swedish approach to affordable housing,” said Norris. “I think a good model would be something like the cooperative ownership they have in Sweden where you buy the house of the apartment you then have to sell it on again at an affordable price to the next purchaser. A model like that where things would remain for affordable purchase would be much better. Email “Affordable housing costing €200,000 per unit sounds good, but there have been problems with it in the past”. Feedback on “Affordable housing costing €200,000 per unit sounds good, but there have been problems with it in the past”.